After a hiatus much to long, we’re back to wish everyone a happy Halloween. B and I will likely be celebrating with The Corpse Reviver #2. Since we already had whack at that one, I’ve decided to mention another one that has quickly ingratiated itself to us. We found the receipe in Robert Hess’s The Essential Bartender’s Guide and in remarkably few other places. Hess gives the recipe, but no back story. No problem, I have Google. Curiously, about the best I could find is that the Washington Post has a recipe that was adapted from the 1934 edition of The Official Mixer’s Manual by Patrick Gavin. Okay, good; it’s old. Another column in the Washington Post entitled The Murky Depths of Old-School Cocktails by Jason Wilson mention Hugo Ensslin’s 1917 Recipes for Mixed Drinks and a lightweight hall of fame boxer named Dave Deshler. Okay enough speculation on the back story. Onto the drink. Let me begin by saying that one should be profoundly skeptical of any drink that is impudently compared to a Manhattan. I mean skepticism like you would reserve for a friend who says “I really like my new flying car. It runs on parsnips.” Curious? Put the orange and lemon twists into the mixing glass and gently muddle to release the oils. Add the remaining ingredients with ice and stir. Strain into a chilled cocktail glass. The similarity to a Manhattan are pretty clear. 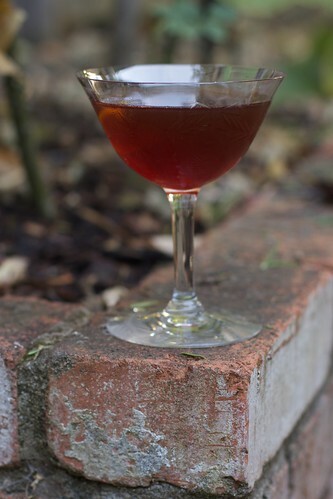 It starts with rye, but you substitute Dubonnet Rouge for the Italian vermouth and Peychaud’s bitters for the Angostura bitters. Also the ration of apéritif to rye is higher. Finally you add an additional citrus flavor with the two twists and the Cointreau. This all results in a cocktail that is still complex and balanced, but is a little lighter and fruitier. It’s a like a Manhattan that doesn’t take itself quite as seriously. The Deshler would also be a good choice for guests that are quite such grizzled cocktail connoisseurs. The Manhattan is, in my opinion, still the greatest cocktail of all time (sorry Martini drinkers, I just can’t fall in love), but the Deshler, like it’s name sake, is a scrappy lightweight. The scrappy lightweight counterpart to the greatest cocktail of all time… that’s pretty high praise! Now, is there a featherweight version?